A pocket knife is a handy tool that you need when camping. But how do you narrow down to the best camping knife? Choosing the perfect knife can be tricky especially if you are buying for the first time. However, you don't have to worry because we have done the work easier for you. The handle is an important part of your pocket knife so you want to ensure that you get the best. A good handle should provide you with a better grip to prevent slipping when you are using. Again, you don't want to end up with injuries simply because your knife has a defective handle. Some pocket knives are designed with handles with a textured material meaning that they are less risky especially for people with sweaty hands. Not only do you need a pocket knife that is designed with the sharpest blade but also a durable blade. Get a pocket knife that requires less sharpening so that you can keep the maintenance low and durability high. One of the best blade materials that you should consider is stainless steel. Not only is this material durable but also anti-corrosive. This is another crucial aspect that you should check in a pocket knife. 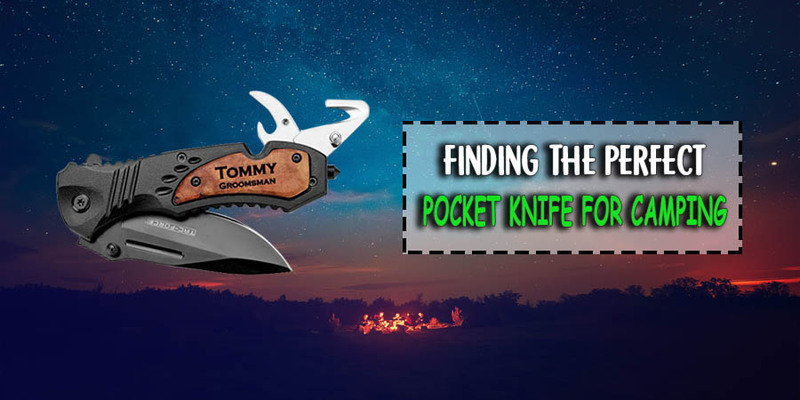 The last thing you want is a camping pocket knife that unfolds even when it is not in use. Check if the knife features a large drilled opening to ensure that you can use it with ease even when you are wearing gloves. Again, the locking mechanism should not require too much effort to activate. It is also great if you consider the features that you want in the camping knife. Some people prefer a knife that can handle a wide range of tasks. This means that it should have some multi-tools built-in. in as much as the knife might be bulky, you will enjoy the functionality and versatility. Again, if you just want a basic camping knife, a model with a simple serrated blade can be great and it will do plenty of tasks in the woods. How do you want the knife to feel in your pocket? If you don't want the knife bouncing in your pocket, you can consider having a clip. This will help you to attach the knife at the entry of your pocket so it will not bounce. When you are out camping, you want compact and lightweight tools that are easy to carry. This means that you should also consider the size of your pocket knife. The fact that it is a pocket knife doesn't necessarily mean that they are all designed the same. Some knives are long while others are short. So don't want to have a bulky camping knife that will barely fit in your pocket. Ideally, the right size of the pocket knife I would recommend is between 3-4 inches blade size. What is your budget? It is great to buy a camping pocket knife that is within your budget. Buying an expensive model doesn't mean you will get the best. However, you should not compromise on quality simply because you don't want to spend more. With a budget of around 30 bucks, you should get yourself a quality camping pocket knife that will offer the best performance and durability. A pocket knife is a versatile tool that you should have when you are camping or engaging in other outdoor activities. I believe after checking the above tips, you will not have trouble selecting a perfect pocket knife for camping.